Out here in the North Sea, love usually passes a man by like a ship in the night. 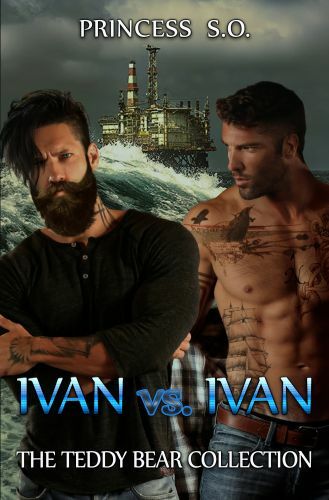 So it’s a nice surprise when the captain of the ship hired to transport Ivan’s ocean platform rig into port for the winter might actually offer some unexpected non-business type amenities as well. Ivan Voloshyn owns and operates the Marianna Shoal, a deep sea oil rig. It’s hard work and long days out in harsh weather. And he loves it that way. Because that’s what he knows. Seabeds— rigs— oil— and bad weather. He’s also about to find out the Norse Gods have a sense of humor. For who should it be to come riding in on the Sea Dock Heavy Lift ship? Another Ivan. Captain Ivan Blažević knows who he is and what he wants; problem is, he also knows he can’t have it. Just because the rest of the world is coming out of the closet doesn’t mean every gay man can or should. Out here on the seas, the weather can change in an instant. He needs to trust his crew to do their job, and their hostility towards gays would get in the way of that if he was ever found out. Ivan-the rig-owner’s very presence threatens Blažević’s closet doors, nevertheless it’s hard to turn that away, because he wants him to keep doing so. Out here, the North Sea can change a man’s life— but hatred can take it away.